Seen in the neighborhood. 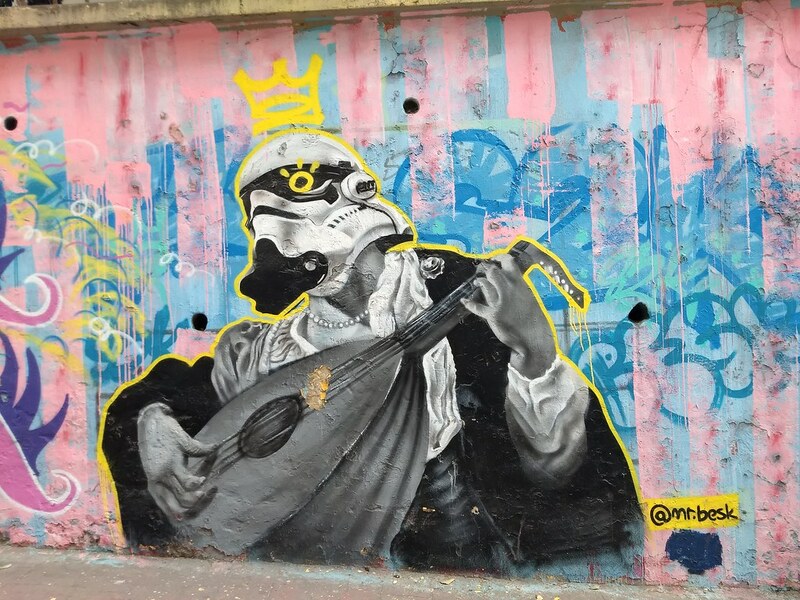 Somewhere in Cihangir or Beyoğlu. Maybe I’ll still write something in future. But in the meantime, I’m kind of desperate to finally be done with Turkey for now and to write about my trips elsewhere, as I’m still way way behind. So, to finally wrap up, here’s some of the stuff from the notes that I do have – further thoughts and reactions written during my time still living in Istanbul with my girlfriend last summer. I guess one place to start is to say a little bit about the language. I never took any classes or anything, never learned much beyond some very basic phrases. But, after six weeks of being immersed in it, just from signs and storefronts and menus and book covers, from overhearing conversations, and from the very few words and phrases that I did learn, I guess I feel like I have some sense. I can’t say much about sentence structure, verb conjugation, anything, because I don’t know them. Except to say that it’s nice that it’s basically similar to Japanese, in just a few very basic ways. The word order is similar – while I’m sure most learners of Turkish have trouble wrapping their minds around the Subject-Object-Verb word order, as I did when I was first taking Japanese, I’m now pretty comfortable with it. So whatever few phrases I did learn in Turkish, it felt pretty smooth to me to think about ordering my words in that way. 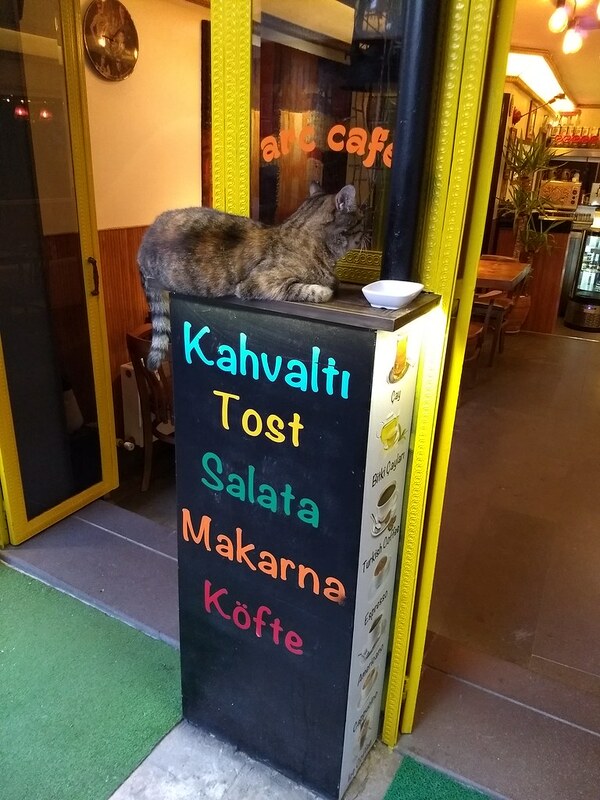 Right: Just a few examples of Turkish loanwords: Tost for “toast” (a grilled panini-style sandwich); Salata for salad, presumably from the French salade, Arabic sulta or the like. Not the greatest example, I know, but the best I could find, apparently, out of my photos from the summer. Anyway, I think one of the things I’ve enjoyed most about Turkish just from the very basic exposure I’ve had visiting here, and helping my girlfriend study for her vocab quizzes, and not actually studying the language myself is the way they use so many loan words, and spell them phonetically in their own way. Of course Japanese and pretty much every other language do this too, but even so, Turkish being what it is, not a romance language, not a Semitic or Sinitic/Japonic language, but something else, and doing this in a different way , but still in Roman letters – everything looks so foreign and yet so familiar. Kek for cake. Müsik for music, vagon for train cars, istasyon for station. 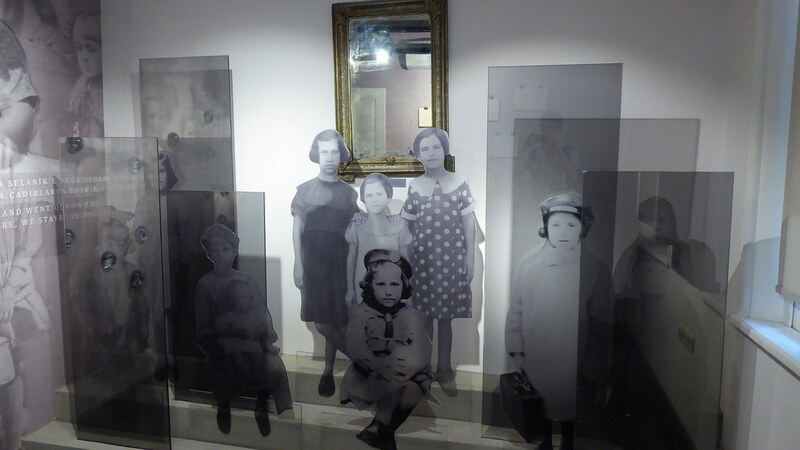 A display at the Alaçam Population Exchange Museum (Alaçam Mübadele Müzesi), a small house museum in Istanbul dedicated to the story of Greeks forced to return to Greece from Turkey, and Turks forced to return to Turkey from Greece, at the fall of the Ottoman Empire, and the difficulties of the journey and re-settlement, etc. Another thing I just loved about being in Turkey (Istanbul in particular, I suppose) is that it’s right at the center of so many different cultures and ethnicities that you normally would never hear about, learn about. Here in the US, we might learn about French, Italian, and German history, or about Chinese, Japanese, and Korean culture. And walking around our neighborhood, we might meet Black, Hispanic, Jewish, Arab, Indian, East Asian, Irish, and Italian people. But in Istanbul, you’re encountering either people or cultural elements from Armenia, Georgia, the Black Sea region, the Prince’s Islands (Adalar), Turkic peoples from all the way across Asia… Just talking to people in Istanbul, we met Jews, Kurds, Armenians, Arabs, Uyghurs, Kazakhs, Azeri.. all kinds of people. And just a couple minutes walk from the very center of tourism in the city (i.e. 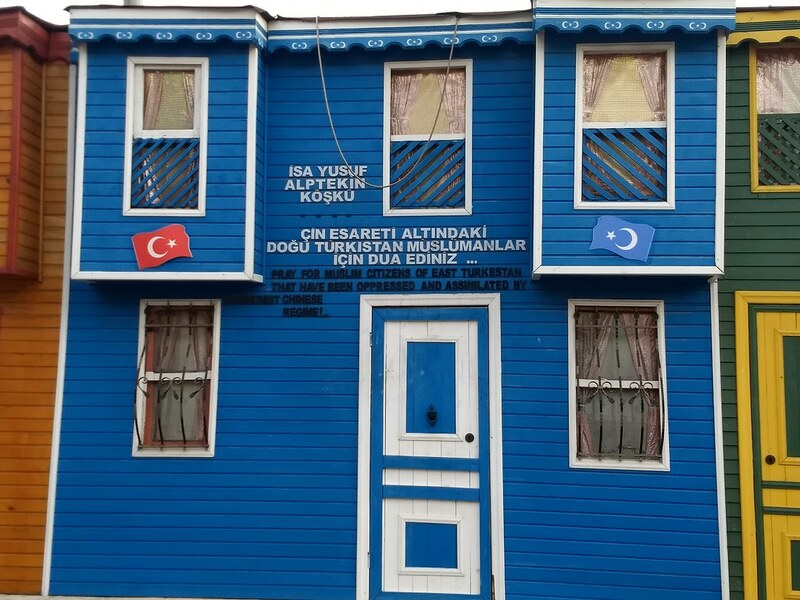 Sultanahmet; the Hagia Sophia and Blue Mosque), there is a whole row of houses and a restaurant housing some kind of pro-Uyghur activist organization that isn’t trying very hard to keep their heads down, stay off the radar, at all. Speaking of ethnic minorities, many parts of Turkey have in recent years become home to significant numbers of refugees from Syria and elsewhere. I don’t know the details, but I believe I remember hearing/reading that the Turkish government made some kind of agreement with the European Union, that so long as Turkey takes X amount of refugees and doesn’t allow them to enter EU territory, in exchange for, according to Wikipedia, a “re-energized” consideration of Turkey’s bid to become an EU member country, eased visa requirements for Turkish citizens, andsome 6 billion euros in aid. From talking to shopkeepers, musicians, barbers, fellow visitors, etc., we got the impression that a lot of people in Turkey are worried that the Syrian refugees, simply by their presence, their social/societal/cultural influence, are pushing the society & politics further to the Right (and towards Islamist fundamentalism). But others we spoke to said the Syrians they knows are very modern and tolerant people. And that most refugees are not so fundamentalist – they’re just poor people. They suggested that it’s the Erdoğan government or other institutions that pressure people to be more religious or more observant in order to receive benefits. 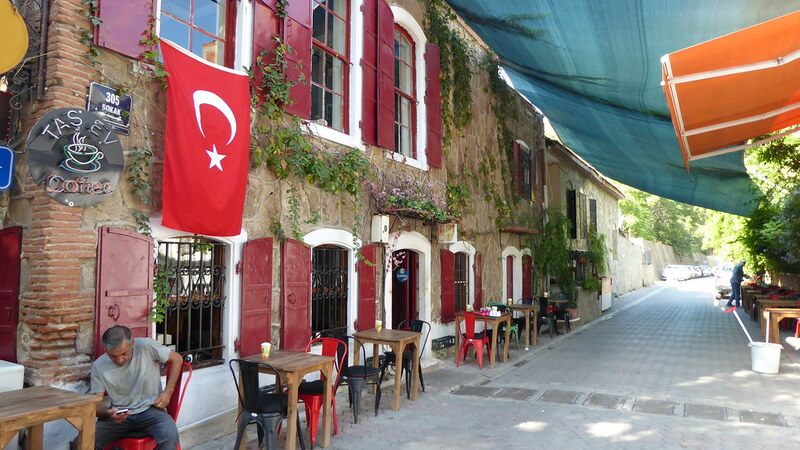 I don’t think I have any pictures of Syrian refugees, so I’m going to go with this photo of a café and alleyway in Izmir, with a large Turkish flag. I imagine this flag must carry very mixed and complex meanings for many people. Trying to find something to say to wrap up my whole Turkey experience this past summer, I find I barely even know what to say. I suppose this is in part because it was my second time, so it’s not so unusual anymore, and because we were more in “living in Turkey” mode than tourist mode, really. Spent a lot more time in shopping streets and malls, and doing other simple sorts of things than we did visiting museums or historical sites, or actively trying to try / experience new things. So I guess that makes a big difference. Mostly, I guess I would say my main impression coming away from it is that Istanbul is a pretty nice city to hang out in for a few months (or maybe even up to a year, or longer…?). I would definitely be interested in seeing more historical sites, more museums, more art galleries + shows, more music performances. I’d definitely be interested in seeing more of the country, too. But at the same time, it’s just a good city to live in. So long as the purchasing power parity remains as it is – and most especially how it was this summer, much more so than last – we Americans, even on a paltry grad student stipend / summer funding, can afford to live pretty damn well in Turkey. We had a beautiful apartment (for $1300 / month, not exactly pennies, but even so, a place that would easily cost twice that in any major US city) with a gorgeous view. We ate out nice breakfasts about half the days, and went out to nice (not super ultra fancy, but nice) restaurants for lunch or dinner quite frequently. I don’t think we were living some incredibly lavish lifestyle, either, but just the sort of standard big-city sort of life that we all wish we could afford in New York, LA, or San Francisco. A meal that would have cost let’s say $60 or so, or likely even more, for two people back home, including a salad or appetizer, two entrees, and basic drinks (e.g. lemonade), was 100 lira – at the current exchange rate, about US $16. It’s just such a wonderful privilege to be able to go out for dinner, and not worry about going out to dinner to begin with, as an expensive option to begin with, but also (2) to not have to feel like ordering a drink, or an appetizer, or a dessert, is too extravagant. That alone, regardless of the particular cultural feel of the city, or anything else, makes Istanbul just a fantastic place to be. I so wish that one could live like that in New York or LA, in Honolulu or Tokyo or Kyoto, in London or anywhere else in Europe. Just some cats, chillin’, at the top of the stairs near our apartment in Cihangir. It’s weird. I don’t know. Last year, when I went to Turkey for the first time, it was my first time going to a Muslim country. And I was nervous. Istanbul is not just like any (other) European city. The mosques and the several-times-a-day call to prayer, the dominance of certain foods and not certain others, not to mention the largely invisible but nevertheless ever-present looming danger of the authoritarian state, make it a very different place from what we typically picture when we talk about visiting Europe. And I do definitely still feel much happier, more comfortable, more excited to be in, say, Tokyo or Kyoto or Naha than in Istanbul. It’s just not my first choice of cultural appeal. Ask me which cities (or cultures) of the world have the best food, or which country’s historical sites or music scene or art museums I most want to see more of, and Turkey is admittedly not at the top of my list. I still have never been to China or Taiwan, or most of Europe. But, while I never would have expected it a year ago, I think I really have grown pretty comfortable with Istanbul. The people are nice, the language of course is difficult but thankfully it’s written in Roman letters and uses a ton of loanwords, and just, overall, even the things that are decidedly “foreign,” such as the mosque-dominated skyline and the sound of the muezzin every day, are things I’ve grown used to and just don’t see as so unusual anymore. And there’s just a lot of basic everyday things to enjoy about Istanbul. So many nice cafes – if you want to call them hipstery, or if you just want to call them nice. A good public transportation system, with tapcards (New York is still behind on this one), and streetcars (trams), subway, and ferries that all run more smoothly and nicely, through nice clean stations. Not to mention, the deepest subway tunnels in the world, connecting Europe and Asia. I mean, few public transportation systems in the world compare to Tokyo, but Istanbul is certainly levels above New York or Los Angeles, and I would say compares well to most other cities I’ve been to. I love taking the ferries, and getting to see those wonderful water views of the city. And I love that you can get most places on public transportation. Strangely, it seemed super often that we had to take a bus, rather than the tram or subway, to get where we were going, but… oh well, I guess. 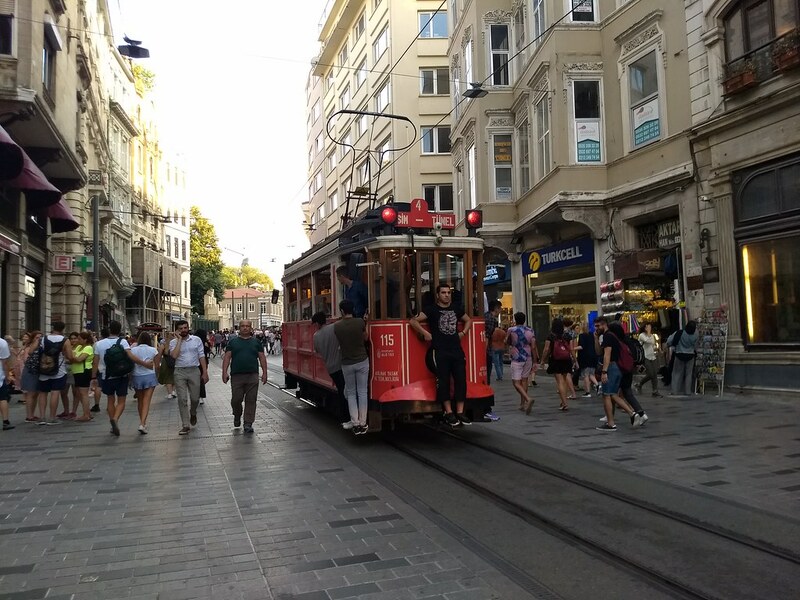 A historical streeetcar running down İstiklal Caddesi (Istiklal Street, or lit. “Independence Avenue”), one of the chief shopping/tourist streets in the city. Not really so indicative of the real everyday Metro experience, but, makes for a nice photo perhaps. And the shopping malls and clothing stores and so forth are super modern, super sleek. Cleaner, nicer, brighter, more modern feeling than even in Japanese shopping malls probably. Of course, the exchange rate / PPP really helps with this. We could afford to go to the fanciest malls, the nicest shops. A shirt that might be $50 or $60 back home, or even $100 might be 50 or 60 lira – less than ten bucks. And a dress from a fancy high-end store or little boutique that might be hundreds of dollars back home, even if it was 300 lira, that’s still less than $50 at the moment. I’m not sure Turkey is my number one top favorite place for food (sorry!). I’m much more excited by even the most basic everyday food scene in Tokyo, Kyoto, or Naha – or by Italian pasta and pizza – but, even so, I loved getting to know the distinctive Turkish specialties. Totally fresh juice, fresh squeezed directly from the fruit as you watch, for just 5-10 lira. A fresh fruit juice vendor in Istanbul. Somehow out of my hundreds of photos, I never took one of one of these stands. So this is a photo from Turkish blog http://berfendber.blogspot.com/. We got lucky, or I guess maybe we knew about it as part of the selection process, but we ended up just a couple of blocks away from a ton of different cafes + breakfast places, including some of the most widely best-rated, best-reviewed breakfast places in the city. But it was such a nice combination of these kinds of totally modern, clean, sleek, good cafes, and also right in the same neighborhood good mom+pop sort of stores. When we ate breakfast in, I would go up to the local bakery and get fresh bread every day. Simit – often badly translated as “bagels,” they’re rings of bread covered in sesame seeds. More like a circular pretzel than anything. So fresh, so good, and so cheap! Let’s see… other foods. I loved the rice pudding (fırın sütlaç). And of course there’s döner kebab, falafel, köfte (meatballs). I found these all to be pretty meh compared to what I’ve had elsewhere. The shawarma joint in LA, for example, which pretends to be a shawarma joint in New York at the end of the first Avengers movie, is surprisingly excellent. Not just a funny fandom / movie history sort of take a photo and check it off the list sort of spot, but really genuinely tasty food. Much better than the meat I had in Turkey. Sorry. But, still, so many other foods! It was nice from time to time to have what they call “tost”: just basic panini-pressed sandwiches, with cheese + tomatoes, or cheese + pesto sauce, or whatever. And kumpir – baked potatoes loaded with whatever toppings you choose. Oh, and börek, of course, though I think maybe having that every day for the one week we were in Turkey last year maybe got me a little bored, a little “over” the borek. Oh, and manti was a good experience. I’ve been bad and have been slipping ever farther from any semblance of observing kashrut (oh well); though I still get nervous that my body isn’t used to certain foods and might get angry with me and make me sick, even so I did enjoy several times a dish called manti, which is tiny little meat raviolis served in a mix of tomato sauce + thin yogurt. Rumelihisarı, the first Ottoman fortress built on the European side of the Bosphorous. 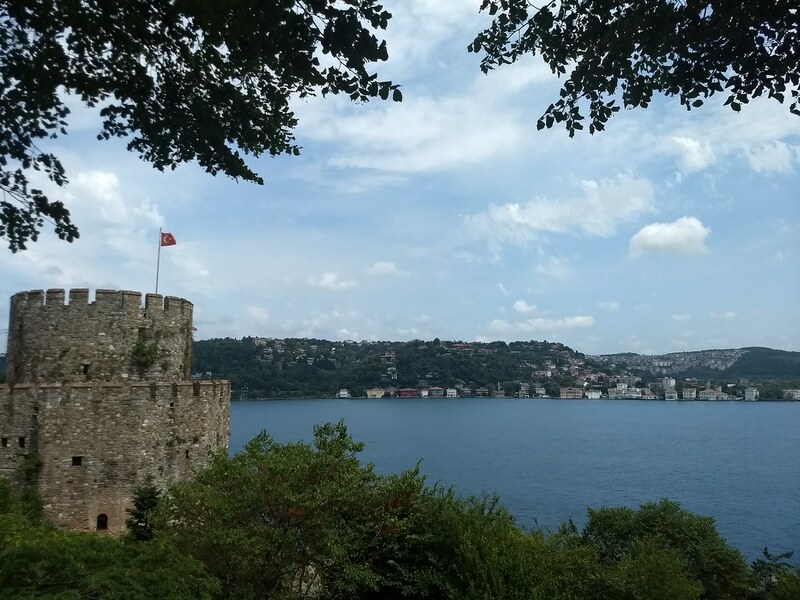 Built in 1452, it played a key role in allowing for the Ottoman conquest of Byzantium/Constantinople the following year, as it was used along with the corresponding Anadoluhisarı on the opposite shore to block Byzantine reinforcements or re-supply via the waterway. But the non-Turkish food was good too. It varied a lot, as it does for example in Japan. You’re not going to just step out your door and find good Italian or Chinese/Japanese or Indian food, let alone Mexican. But if you research around online a bit, or just get lucky, there’s some amazing food. Simone said that at most restaurants, the pasta is not served al dente, but rather overcooked, soft, by Western standards. But we ended up going several times to a chain restaurant called Midpoint, which I still find a little funny since it’s basically like an upscale mall restaurant, a corporate chain. But, still, damn it was good. I’m blanking on which restaurants to compare it to in the States, but it’s like when you find that that one place just has such amazing mushroom tortellini, or whichever one particular dish it may be… I want to go back and have that mushroom tortellini again. Oh, and the çay – Turkish tea. How could I forget? I still haven’t tried Turkish coffee, haha. We kept putting it off with the plan of finding somewhere where they might read your fortune with the coffee remains at the bottom of the cup. We never did. But, oh, how I love their tea. I love all tea, really, if it’s made right. Somehow brewing my own tea never really did it, but just a basic 4 lira çay (black tea with or without sugar, no milk) at just about any shop, much like the free green tea they give you at most places in Japan, is just *the best*. I love it so much. I wish I could just drink tea endlessly. But enough about food, I guess. One thing I’m definitely going to miss is the kitties. 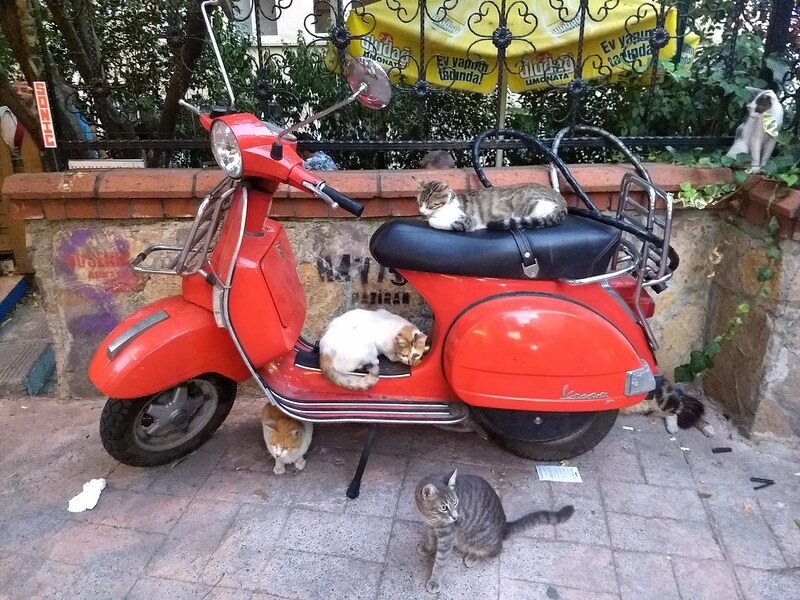 The street cats. 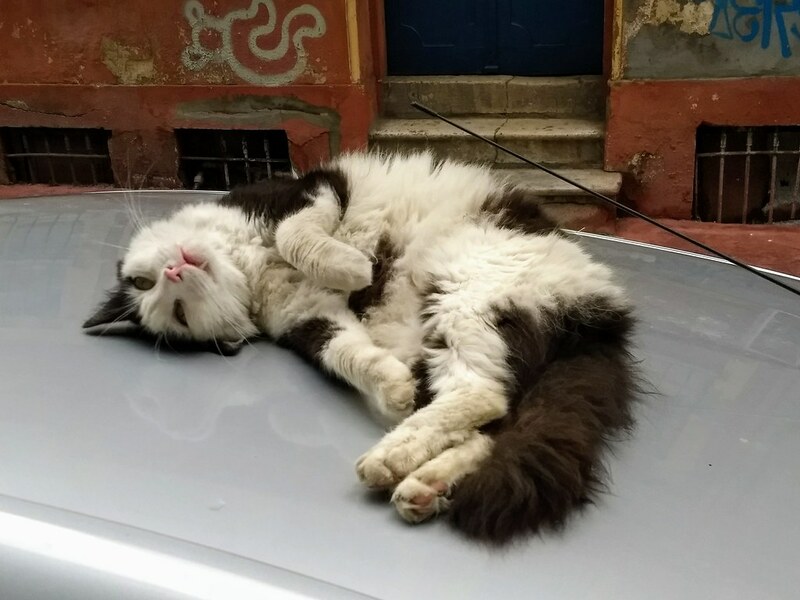 If you’re familiar with the documentary Kedi, then you’re already familiar with this, but there are street cats everywhere in Istanbul, and the people are really kind to them. They get food and water, they get petted and loved, and they get left alone. Sometimes people shoo them out of restaurants, to be sure, but for the most part, they’re just around, and they’re friendly, and good. I very much miss living with a cat, and I very much look forward to doing so again, but even that is just not the same as having a wide variety of cats at your disposal every day. 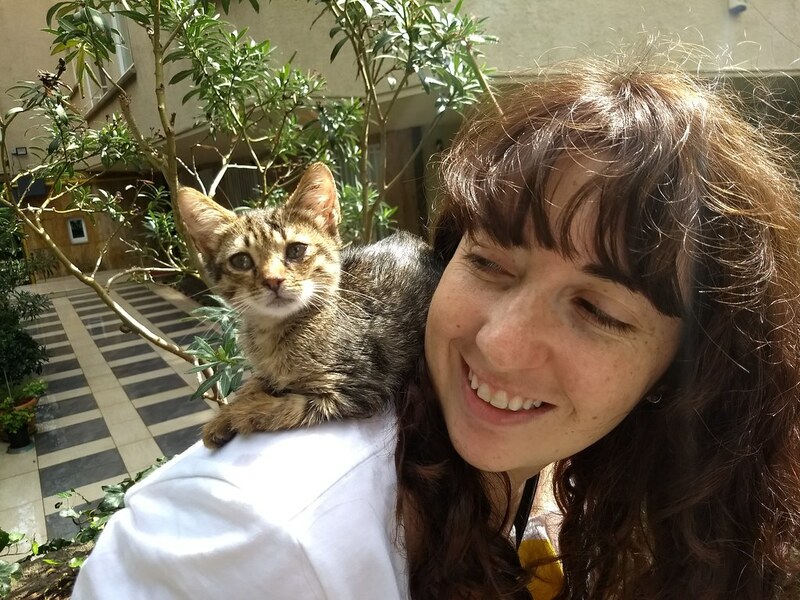 Sure, the street cats won’t come and sit on your lap (or on your laptop) while you’re working at home, or curl up with you in bed, but you can go just about anywhere and meet new cats, or check in with the same cats day after day, and you can enjoy the variety. We definitely got to know some of the cats in our immediate neighborhood. Right outside our apartment was a fussy guy we called “My Best Friend.” He seemed to have no interest whatsoever in being anyone’s friend, and pushed Simone’s hand away whenever she went in to pet him. He had this look on his face like “ugh, I don’t want to have to deal with this woman. Leave me alone.” It was super cute. We also met cats who followed us for blocks. I had always sort of felt bad for indoor pet cats, because they’re stuck in the same small space all the time. I always imagined that free street cats would wander and explore the whole city. But as I learned, to my surprise, they don’t. They just stay in one spot, one street corner or whatever it may be, of their own volition. And at the top of the stairs (a set of stairs linking our street to the next parallel street up the hill from us), a kind man was just there constantly tending to this whole bunch of cats. He set up a whole little camp for them, with a tarp providing shelter over a whole little area of pillows and boxes and food dishes and so on. And these cats, some fifteen or so of them, just hung out there at the top of the stairs, all the time. There was a super friendly one Simone dubbed “Longcat.” A calico one we called “Anne,” the Turkish word for mother, since she constantly had tiny kittens (mostly or entirely not hers) suckling at her. A tiny one the man had named Kerchu, possibly because she was sick for a long time and was always sneezing. Kerchu loved to nuzzle and cuddle, and would just curl up on Simone’s lap for ages and ages. Another tiny one was called the Bumbler, since when we met her she just seemed so lost, and bumbled around, not really interacting with the other cats, looking quite disheveled with her fur all over the place. We then didn’t see her for a long time, and got worried, but we then saw her again, and she’s doing so well now! Not disheveled anymore, not looking lost, just living a nice happy kitty life. Either Kerchu or the Bumbler; I forget which. :/ Either way, super cute. What else can I say about Turkey? I don’t even know. On my first visit, it was all so new to me, and so I was so struck by the overlapping layers of history, just trying to wrap my mind around how aspects or elements of Greco-Roman, Byzantine, Ottoman, and modern Republican histories overlapped and intersected and poked through, their influence still visible. And not just these periods of history, but also the many cultures that were once part of the Ottoman Empire and are still very much a part of Turkey today, even if ethno-nationalists and religious fundamentalists wish otherwise. We met tons of people – shopkeepers, booksellers, musicians – who had nothing negative at all to say about Greeks, Armenians, Kurds, Jews, and talked about how they wish their society was more multi-cultural, or more accepting or acknowledging of the multi-cultural, than it is. Of course, I mean, what are they going to say, to us, other than to be polite and positive in that kind of way? But, still. And of course, that’s politically sensitive, and complicated. But on a related note, I guess, let me just conclude by saying something about how interesting it is to travel to different parts of the world and see which cultures have any kind of prominence there. In Japan, of course, there’s plenty of Chinese and Korean music, Taiwanese TV dramas, I dunno, whatever. And plenty of American and European stuff too, for sure. But I can imagine that if I went into a record store in Tokyo and was looking for Turkish, Armenian, Greek, or Jewish music, they likely would have next to nothing. Hell, they often have only the slimmest of an Okinawan section, and that’s for a region within their own country. Of course, I would expect record stores in Turkey to have a ton more Black Sea music, Greek music, Armenian and Kurdish music, music from tiny ethnic groups I had never heard of such as the Laz and the Hakkari. But what I’m getting to, and what I found quite interesting, is that because of Turkey’s historical and cultural connections to the various Turkic peoples of the world, there’s actually (in certain ways, just here and there) a lot more presence / prominence of Uzbek, Uyghur, Azeri, and other Central Asian Turkic cultures than I would expect you’ll find most other places. Just looking around at the other people in the restaurant, or on the street, it’s of course quite difficult to tell sometimes who’s Turkish vs. European, who’s Turkish vs. Arab, and of course there are a lot of white/Western, Arab, and East Asian tourists. But, every now and then, somehow or another, you realize (or gather, or suspect) that someone who passes you on the street, or someone standing near you on the subway, is Uyghur, Kazakh, or Uzbek. And it makes sense – the languages have similarities, the cultures have some similarities; they probably visit Turkey for much the same reasons as Arabs do, seeing it as a country that’s not too foreign, a country they can visit and have some familiarity with the language, culture, food. It would be interesting to know some kind of tourist statistics, maybe. With most Uyghurs (and various kinds of Mongols and Tatars too) being Chinese citizens, that of course would complicate matters, but even so I’d be curious just how many of the tourists who might otherwise pass for East Asian (or white) are actually Central Asian. It just goes to show how much your worldview and experiences can expand when traveling – to visit Turkey is not only to encounter Turkish culture, but to encounter so much else, of Balkan, Central Asian, and Sephardic culture as well. The world is so rich and complex and diverse. Get out there and explore, with an open mind, and broaden your horizons.